(Wed., May 21, 2014) The remainder of the day was dedicated to exploring the homeland of Chardonnay, so we headed south out of Beaune to the famous villages of Meursault, Puligny Montrachet and Chassange Montrachet. 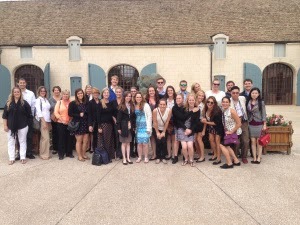 The first stop was lunch in Meursault where everyone came to realize that you can’t rush a meal in France. So though we were a little late for our next appointment, we managed to make up time later. After lunch we had an appointment at Caves Ropiteau Frères at 2pm where we met with winemaker, Nicholas, who provided a quick tour of the cellars and explained the fermentation process for their chardonnays. He described the battonage process of stirring the lees in the oak barrels, and then we had a chance to taste 3 wines in the visitor’s center: 2010 Meursault, 2011 Chassagne Montrachet, and a 2009 Volnay. Next we drove through the tiny village of Puligny Montrachet and turned right to follow the small paved road that led through some of the most famous vineyards in the world. 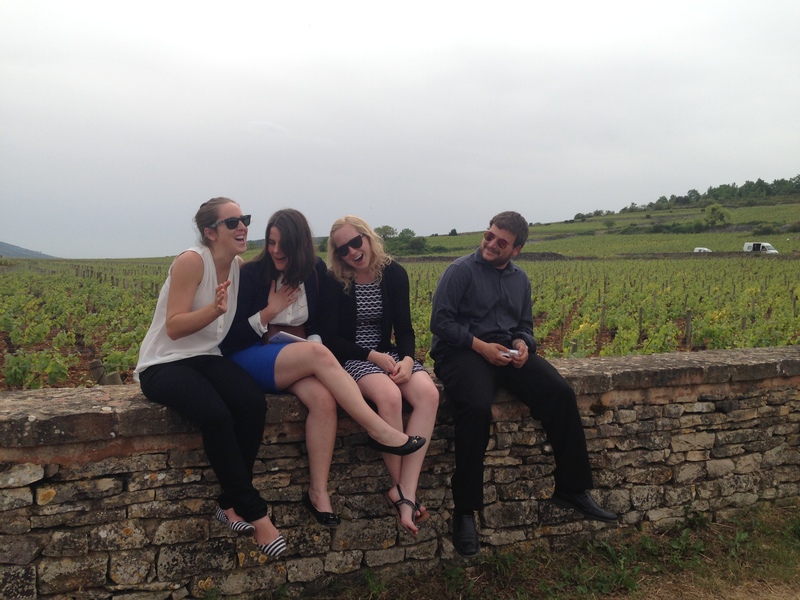 We stopped at three Grand Cru vineyards to take photos:Le Montrachet, Chevalier-Montrachet,and Batard-Montrachet. It was thrilling to gaze out over the incredibly lovely view of thousands of chardonnay vines with the small villages in the background. One of the nice aspects of Burgundy is that most of the famous vineyards have rock walls around them and signs or pillars announcing the name of the Grand Cru vineyard. 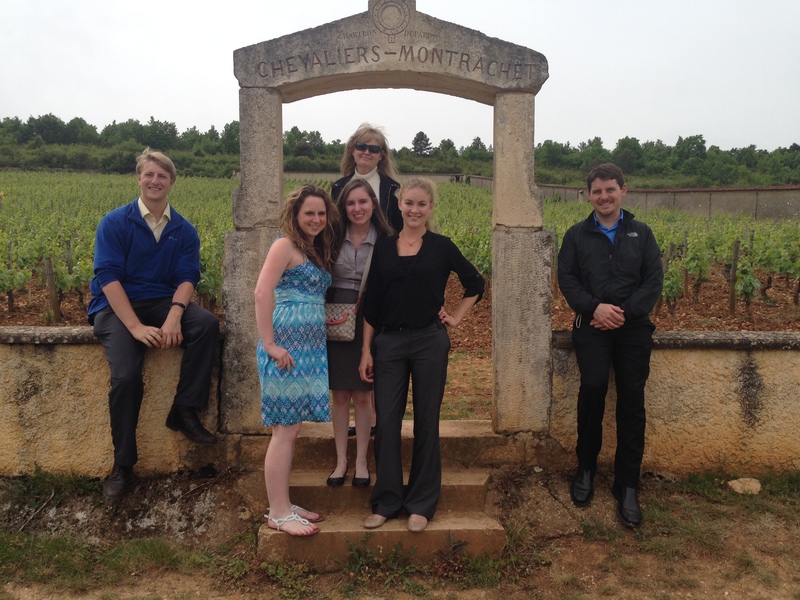 We continued south through Chassange Montrachet and a few minutes later arrived in Santenay. Everyone was amazed at how small and how close all of these famous villages really are. 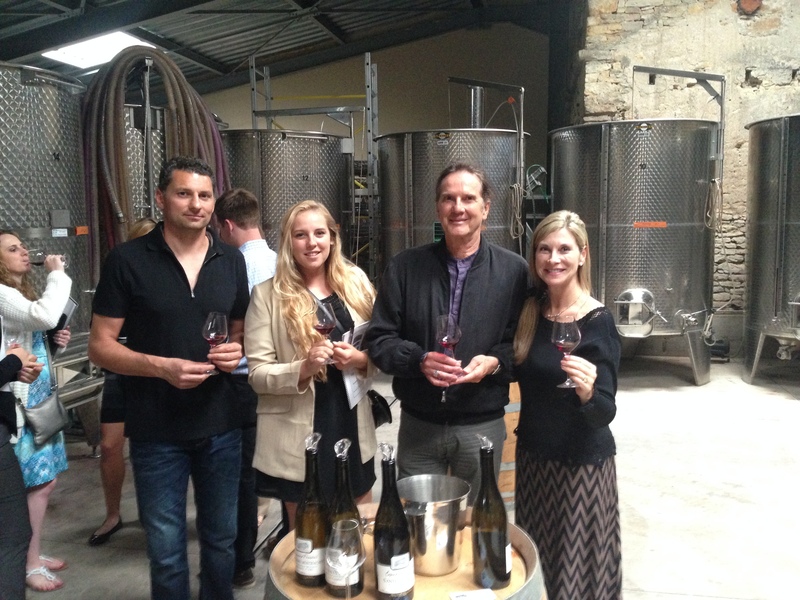 In Santenay we met with John Capuano, owner of Domaine Capuano Ferreri. He was tall, charming, and only spoke French, but fortunately Brielle was able to translate for us. John explained that the domaine was quite small with only 12 hectares and producing 6500 cases per year, of which they export 35%. They are a relatively new winery in Burgundy, having only been established for 50 years, whereas most of the others we had visited were at least 200 years old or more. We tasted 5 wines here, and John delighted us by pulling some 2013 wine from barrel as he was completely sold out of the 2012 with the exception of one chardonnay. The highlight was tasting a 2013 Santenay Chardonnay that was lean with honey and spice notes, and then comparing it was a 2013 Premier Cru Chassange Montrachet vineyard that was only a few meters away from the Santenay village vineyard. The difference was amazing, because the Chassange Montrachet was more full bodied, with apple and oatmeal notes. However John said the same winemaking techniques were used, and the only difference was the terroir. A truly eye-opening experience about Burgundy and how a few meters apart can make a huge difference in taste and quality of appellation. That evening was another free night in Beaune, and most everyone wandered into town to check out restaurants, bars, and the beautiful architecture of the ancient walled city.